Where would we all be without the sun? The bright shining star that we, on this tiny green and blue planet, tend to take for granted, is the source of all life. Without it we would all be in the cold and dark, nothing would grow or thrive. We would not be able to see or share the amazing beauty in our world. Though the sun sets at the end of a day, it will always rise again to bring a bright new beginning. Part 16 begins the setting of the sun on this wonderful journey we have all been sharing. Remember the sun is constantly changing, and is so much more than it seems to be! So take care to be mindful as you journey around the different suns this week. ♥ Please remember this is my design and is covered by copyright law. You may share a link to this page with anyone, you may print off the photo or written tutorials for your own use, but please do not alter or change in any way. ♥ If you haven’t read the introduction post, then please find it here. You will find all the information on Yarn Packs, how much yarn you will need, hook sizes, the finished size of your blanket and all the resources available. ♥ It is worth book marking the main Mandala Madness page as it will contain all the posts about the project and each weekly part. ♥ You may also like to add this CAL to your Ravelry Queue. ♥ I suggest taking a look through the photo tutorial here before downloading the pdf to work from, but if you just can’t wait to get started I have put all the pdf downloads together. ♥ And for those of you who like to follow the Video Tutorial by Esther Dijkstra from itsallinanutshell.com, just click here and the link will take you straight to the video for this part. For the translated versions of the CAL, please click on the links here and it will take you straight to your preferred language. With no need to scroll down further on this page. ♥ Korean Mandala-Madness-Part-16-Korean – 한국어. For the purposes of this tutorial I am using Scheepjes Merino Soft and a 4 mm Clover Amour Crochet Hook. The colours used in each round are listed below. Abbreviations Hints: Are typed in italics and coloured purple, they are to help and guide you and hopefully make life a little easier. Reference to photos is [P] with the relevant photo number. * Repeat instructions between asterisks the amount of times specified. This is normally a repeat for a complete side and will consist of multiple instructions. () – Repeat instructions between parentheses the amount of times specified. This is a lower level repeat. Folding Sc: Insert hook into back loop of next tr and into back loop of corresponding stitch in previous round, yarn over and pull through 2 loops, yarn over and pull through two loops. Hint: where you made 2 fltr [R97] you will need to work both folding sc in the same back loop [R96]. Repeat from * to * 7 more times, omit last folding sc. Join to 1st folding sc, fasten off, and secure ends. Stitch Count: Per repeat: 18 sc, 94 folding sc. Total: 144 sc, 752 folding sc. Repeat from * to * 7 more times, omit last 4 sc. Join to standing sc with a sl-st.
Stitch Count: Per repeat: 76 sc, 44 tr. Total: 608 sc, 352 tr. Repeat from * to * 7 more times, omit last sc. Join to 1st sc, fasten off, and secure ends. Stitch Count: Per repeat: 52 sc, 88 tr. Total: 416 sc, 704 tr. Join to standing sc, fasten off, and secure ends. Stitch Count: Per repeat: 42 sc, 72 bpdc, 24 bptr. Total: 336 sc, 576 bpdc, 192 bptr. Stitch Count: Per repeat: 24 sc, 26 bphdc, 70 dc. Total: 192 sc, 208 bphdc, 560 dc. End of Part 16, see you next week. This blanket has been a pleasure to work and learn. The video is such a help, I couldn’t be without it. I’m on Part 16 and have run out of yarn for the third time. I ran out of the dark purple initially woolwarehouse sent me one. I then ran out of the gray, I had enough dark purple so that worked ok. Now I have run out of the light yellow and I know I won’t have enough of the dark yellow. This has been the only frustrating part. Your pattern sells their yarn. They need to pay attention to this. Woolwarehouse suggested it was my gauge, but I checked it and I am right where I should be. Thank you for the pattern and support and the video. Can this Mandela be done in #10 thread. I know it will be smaller, thinking of once finished framing. What hook suggestion can you make? Maybe a “b”? This is so beautiful. Ha! Ha! I bubbled gratitude all over you and forgot to ask the question I had. I’m almost sure I saw this SOMEWHERE, but cannot find it again. Aren’t the sizes of the various rounds, or of the whole piece at various intervals posted somewhere so you can sort of judge if you’re where you should be, size-wise? I’m pretty sure I’m going to do a smaller version as a baby blanket, just by stopping when I get it to the size I want. But I’d really like to know at about what Round that would be. Where do I start? First, gratitude. Thank you so much. I only recently discovered the whole WORLD of Mandala Madness. Obviously, I’m going to attempt it. It’s stunning. Just looking at all the different versions of it makes me happy. Endorphin rush, I swear! But thank you for this enormous investment of your time and love. The love part is obvious, too. I’ve read some of your words of wisdom and uh, yeah, Girl, “you got yo head on right”! 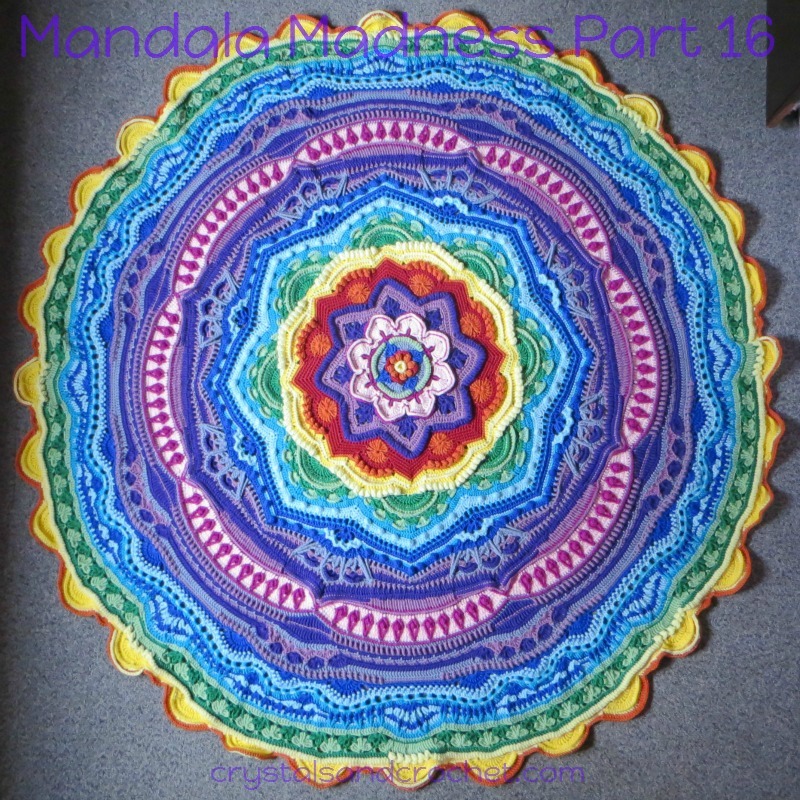 In fact, I’ve hopped around and read a lot of what you’ve written in various places regarding the whole Mandala thing….stitch tutorials (which I’m convinced this project couldn’t be done without! ), info on the use of color, and so important….all the spiritual stuff you share with the world! You’ve given of yourself so much, and come up with this beautiful creation, and all for free. It’s just amazing! Crochet has become a very serious, healing part of my life, and to have access to something like you’ve done here is just…..I don’t know quite how to say it. Of course at this late date past the CAL, I’m way behind on comments on the blog, etc., so I don’t know where on earth you may be now, but if you get to the US, I sure hope I find out about it. We’d eat you up in the South!!! I’m rambling, sorry, but just had to reach out and say thank you. ok so you are on Shell 1, or just after yes? your bphdc will take you to the end of the shell, your 1st sc must be in the 1st sc from R101, it is easy to skip it as the back post sts can hide it, and also make sure you are not skipping an extra stitch after the 5 dc, as again it is easy to skip an extra st there. How long (estimated) would this take to crochet this? Like how many hours? the whole mandala madness would take from 100 plus hours. I’m done. I can’t get the arches to match the picture in placement. My count is off when I add the 6 stitches after doing the 22 and 16 sc 3 times. It’s not mirrored to the other side. I have 2 of the 22 screen side by side after the “shell” and it doesn’t line up to do next”shell”. Can you explain what to do? Please. I have flogged almost every row for the last 10 rows and it’s frustrating now. Thank you for any help you can offer. have you watched the video? the main thing is to make sure you are staarting in the 1st sc above the 1st ruffle st, then the big shell is made in 3 parts, 5 tr, 1 tr and 5 tr over 3 sts, then make sure you are counting the hidden st in the 3 sts you are skipping. That is the most common area to make a mistake, and it will then throw everything off. That’s it!!! The hidden stitch and the starting stitch location. I’ll go watch the video. I depended on the video for an earlier CAL Garden and found it was easier than following the pattern so this time I was strictly following the pattern. Thank you oh so very much, hon. Have a great day. I couldn’t have done it without your help. Thank you a million times!!! thanks Helen. I can not wait to start my project. Hi Helen. I want to start but do not know how much yarn must I get? is it too late to start? my progress will no doubt be slow and i dont want the videos going as i really cant follow patterns. Finishing up a a baby blanket before I start on this loveliness. HOW do you select the colors? You don’t happen to have a “blank” for coloring in and figuring out colors that way? I’m trying to use up some of my stash rather than order more yarn…. (so hard!). Your work is magnificent!!! How many weeks are left? Thank you so much for this huge undertaking! It is beautiful. Beautifull Hellen! Im a nit behind , but cant wait to see how my Pinkadness will look like! 960 stitches at the end.. will we reach the 1K and even go over it at the end?? ?